“No son of mine is going to be named Earl!” My grandmother was adamant. She knew she wanted to name him Carlton, but wasn’t sure what to put with it. 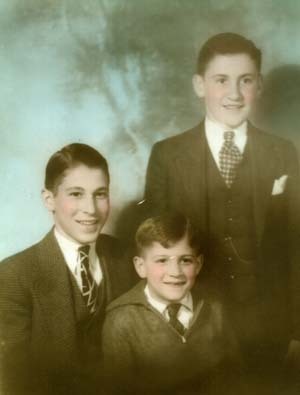 My grandfather was pushing for yet another son to be named after his deceased brother, Milton Earl (the first was Milton Arnold, named after two deceased brothers, one from each of the parents). Listening to the radio one day, my grandmother heard someone mention the name Jack Dempsey, the fighter. She liked the sound of “Jack” and that’s what she named her son, Jack Carlton, who went by Jack. My grandfather must have consented to call him Jack, because that’s the name he put on baby pictures of Daddy. However, in 1930, right there in the census (this week’s prompt), is a listing for a three-year-old male with the initials C. E. My grandfather hadn’t given up hope and must have been the one to give the information, because had it been my grandmother, those initials would have been J. C.! 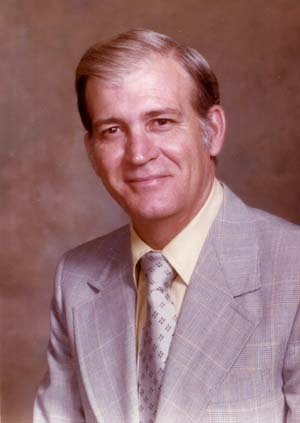 Jack Carlton Rohleder was born 17 September 1927 in Charlotte, North Carolina, the third child (and son) of Andrew Hamilton Rohleder, Jr. (1900-1974) and Myrtle Odessa Primm (1897-1959). Myrtle’s family had a farm and the Rohleder crew would visit regularly. Andrew was a superintended at a cotton warehouse, and liked to take his boys there and to the pump station, both of which provided lots of places to explore. When the stock market crashed, Andrew lost his job at the warehouse, but sold insurance for a while before moving to Rockingham around 1935 where he worked at another cotton company. Daddy played football and baseball in high school and eventually broke most of his fingers in some sort of sports mishap. He was a catcher and his knees paid for that in later years. Daddy was the strong, silent type, but he wasn’t shy about speaking to everyone he knew. In the fall of Daddy’s senior year in high school the family received news no family wants to receive. The eldest son, Andy, was missing in action over what was then Formosa. A Navy dive-bomber pilot, his plane went down on 12 October 1944. It wasn’t until 1949 that Andy’s remains were found and buried in the national cemetery in Hawaii. JACK ROHLEDER is one of the most popular Senior boys. He always wears a smile and really devotes much of his time to doing things for other people. For many years Jack has participated in all the sports offered at R. H. S. He is considered by many to be the handsomest boy in the Senior class; hi is certainly one of the most popular. Jack has a fine “all-round” personality. Jack Rohleder as a young man. 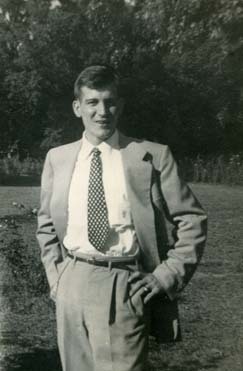 After graduating from high school in 1945, Daddy worked at a local service station until he turned 18. He joined the Army and was stationed in Arkansas where he worked in the motor pool. A good friend of the family, Capt. David Brothers, looked him up. After a quick salute, it was old home week—laughing, telling stories, catching up on news. Daddy’s fellow soldiers couldn’t believe he was hobnobbing with a captain. Daddy was honorably discharged after a year of service. Soon after he and his best friend, George McDonald, headed to Charlotte, and Daddy enrolled in Kings Business College. Now, here we have two young men, not quite twenty years old, who are hungry and have dirty clothes. Hark! Daddy’s uncle and aunt live nearby so maybe they could talk them into a meal and laundry privileges. They were successful, but Aunt Margaret set her price: Wednesday evening prayer service. On one of his trips back to Rockingham to visit his family, Daddy met up with Betty McKenzie, who was home from Women’s College in Greensboro (now UNC-G). They knew each other from high school where they had been in plays together. Betty eventually moved to Charlotte and lived with her uncle and aunt. One thing led to another and they became engaged. Daddy left school and joined Burroughs Adding Machine Co. The couple married in Rockingham in 1950 and started their life together in Lumberton. 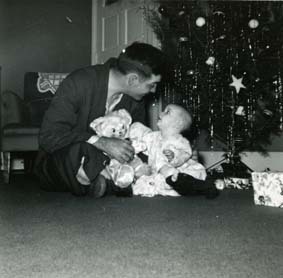 Here I am with Daddy on Christmas morning. All three of his children were born in Charlotte. His mother, still worried about children with what she considered ugly names, told Momma her feelings would not be hurt one bit if Momma didn’t name one of her children after her. Momma complied, though she did like Myrtle’s last name, so that became my sister’s middle name. Myrtle died at the age of 62, and that was the first time I saw Daddy cry. Before my sister was born, Daddy would occasionally take my brother and me to the office with him on a Saturday morning. While he did some work, we would explore, especially the bathrooms! The towel dispenser was a large roll of cloth towels you had to pull on for a clean section. And there was a twin bed in the women’s bathroom. We couldn’t figure out what they needed that for. Another exciting thing about the office was it’s location on the route for Charlotte’s Thanksgiving Day parade. To get us out of Momma’s way while she fixed dinner, Daddy would take us to the office. He’d pull out onto the sidewalk a very large box some business machine came in, and we would sit or stand on that for a great view of the parade passing by. Daddy liked to tinker. He’d bring home adding machines from work to fix, or tinker with the lawn mower, and he needed a place to keep his tools and have a workbench. The first house in Charlotte had a crawl space, and although the door to it was big enough for him to get through, the crawl space wasn’t high enough for him to stand in. So Daddy proceeded to dig out enough dirt to make a room big enough for his workbench and tools, and tall enough for him to stand in with some head room. He ran some electricity down there, and, voila! A man cave—literally! He didn’t have to dig his own cave at the other houses we lived in, but he had a workshop for tinkering—either in the basement, attic, or carport—in all of them. The attic workshop was home to Daddy’s new hobby of refinishing furniture. One of his first projects was probably the most difficult: an old desk with cubbies and a drop-down front. He painstakingly took it apart, even removing the carved embellishments, then stripped the old varnish, put it back together, and stained it. He also tackled an old lawyers bookcase, an old kitchen cabinet, a library table, a set of bentwood chairs, and an old sewing machine he turned into a bar. They all turned out beautifully. Later in life, he would fix old lawnmowers for friends. 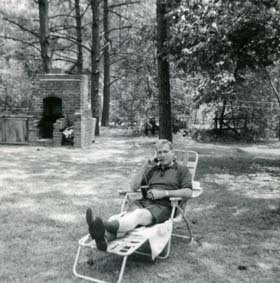 Daddy relaxing in the back yard on Father’s Day. Daddy eventually got a promotion and we moved to Rockingham, and lived there for 12 years. During that time, we kids outgrew getting toys for Christmas. I think Daddy was disappointed, because he liked to get down on the floor and play with them, too! There were family friends who still had small children, so we’d go over there on Christmas day and Daddy would get down on the floor and play with the kids and their toys. During that time in Rockingham his elder brother, Bub, died suddenly. Several years later his father died. His children finished high school and headed off to college. Daddy kept all the college bills and grade sheets in an envelope he had made for each of us. Those envelopes also contained bills from when we were born, and other memorabilia from our lives. Another transfer at work took Daddy and Momma back to Charlotte. Daddy was a Field Engineer at Burroughs, which means he went around fixing business machines. His territory was determined by the number of machines. Half of his territory was in one building in Charlotte, where a business housed their check-reading machines. Daddy went by there every day to make sure everything was running smoothly. He planned it so that he arrived at break time so he’d have a chance to chat with all the people who operated the machines. They loved him! After Momma’s mother had a bad stroke and came to live with them, Daddy took early retirement so he could lend a hand at home. But he didn’t completely leave work. He would help out every now and then on special projects. At some point he started watering the plants, even the artificial ones. The people in the office didn’t have the heart to tell him they were fake. 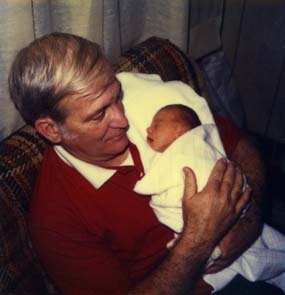 Daddy holding one of his grandchildren. After my grandmother died, my folks had the free time to travel a bit. Besides the trips to visit the grandbabies, they went to New York to visit Daddy’s younger brother, and accompanied friends on a trip north to visit the friends’ daughter. And in all these years, from when they first moved to Charlotte to when Daddy died, they remained friends with four other couples. The Bridge Club, as they were known, was initially five couples who got together once a month to have dinner and play bridge. The host couple, who usually didn’t play bridge, provided the main course of the meal and the others brought either veggies, salad, dessert or bread. These couples were my parents’ closest friends and, once all the kids were out of the house, they would take trips to the mountains, the beach, and even Williamsburg a few times. Daddy died of a heart attack on 23 March 1996 in Charlotte. He collapsed while mowing the lawn and never regained consciousness. He was 68 years old. The funeral in Charlotte was well-attended, as was the burial following in Rockingham. He left behind his wife, three children, their spouses, three grandchildren, a brother, nieces, nephews, cousins—and many, many friends. This entry was posted in 52Ancestors, McKenzie, Primm, Rohleder. Bookmark the permalink. Great (hi)story! Of the Bridge Club, my mon was the first to go, in November of 1995. Your dad must have been the second. The Bridge Club “played” bridge once a month for 46 years. Who is left? Hi Marcia, Claire Rose is the only one left. Yes, your mom was first, then Daddy, followed by Stuart (Nov 1999), Helen (Jan 2000), Terry (Apr 2000), Frank (Oct 2000), Laura (June 2008), your dad (May 2014), and my mom (June 2015). Terry was the oldest, born in 1914, and Daddy was the youngest, born in 1927, a few months after Mom.